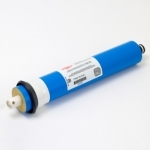 We stock reverse osmosis membranes in the most popular residential sizes, and can get other sizes and styles usually with about a three-day shipping delay. Please call or email if you don't see what you need. “Residential” membranes are standard-sized models that are installed in all standard membrane housings (see the first picture at right). “Encapsulated” membranes are built-in units that come in their own membrane vessel. With encapsulated membranes, both the flow restrictor and the check valve are built in. Check valves to be installed inline before the tank tee can be ordered from our RO Parts Section. With standard RO units you can normally change the production size of your membrane, but you will also need to change the unit's flow restrictor to match the membrane. Again, see our RO Parts Section. A note about membrane sizes: We do not guarantee that the membrane will produce the amount of water that the manufacturer's rating states. GPD (gallon-per-day) performance can go down or up dramatically according to such factors as Total Dissolved Solids of the water treated, water temperature, water pressure, condition of prefilters, etc. 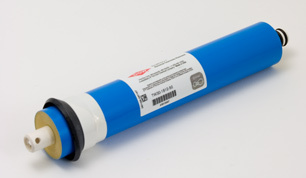 There's a good discussion of RO membrane output variables in our technical section. All membranes listed below, except the final item, the encapsulated membrane, and membranes for Hydrotech and Microline units are in the format pictured at right and will fit any standard membrane housing. Note: TFM and TFC membranes fit our Black & White series reverse osmosis units, our countertop units, our Gold Series units, Hybrid units, and Economy Units. 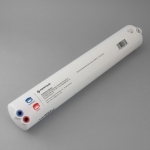 Note: All membranes except the encapsulated model will fit in a standard membrane housing. However, if you change from your original size, you'll need to change your flow restrictor as well. The list below includes standard-sized membranes and one encapsulated membrane. 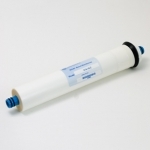 We also stock Hydrotech and Microline membranes. Go here for Hydrotech & Microline membranes. Pentair GRO 36 gallon-per-day encapsulated membrane with amazing 1:1 drain-to-permeate performance. Includes inline 1/4" check valve. Requires 100 ml drain line flow restrictor. Pentair GRO 75 gallon-per-day encapsulated membrane with amazing 1:1 drain-to-permeate performance. Includes inline 1/4" check valve. Requires 200 ml drain line flow restrictor. The following is a list of available WATTS brand Commercial R.O. Membranes. Watts 300 GPD Membrane, 2.5" X 21"
Watts 800 GPD Membrane, 2.5" X 40"
Watts 1050 GPD Membrane, 4" X 21"
Watts 2200 GPD Membrane, 4" X 40"